This month we announced the addition of what could be a controversial interview to the Densho Digital Archive. 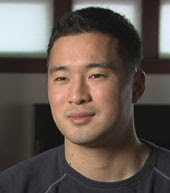 In our October eNews, you can preview a video clip of Densho's interview with Ehren Watada, the Army lieutenant who refused deployment to Iraq on the grounds that the war is illegal. You may consider Watada either a hero or a coward, depending on how you feel about the war in Iraq and a soldier's obligation to follow orders. This news article tells how Watada was allowed to resign from the Army after being court-martialed for charges that could have led to six years in prison. We conducted the interview in 2006 but embargoed it until Lt. Watada's legal situation was resolved. In the featured clip, Watada describes feeling betrayed when he discovered there were no weapons of mass destruction in Iraq. The full interview is available with free registration to the archive.